I’ve been doing body sugaring for a few years now, which has saved me lots of money on waxing, it’s chemical-free, and you can’t nick yourself like in shaving! It’s messy, and awkward, but so satisfying. I wax my calves (my thigh hair doesn’t get quite as cave-woman-like) once a month or so. You can also have lots of success doing your bikini line, but if you’re going to wax your armpits, I’d suggest having a friend you trust do it for you. I’ve failed every time on my own. Mix over medium to high heat. Stir constantly so it doesn’t caramelize on the bottom of the saucepan. After it reaches boiling point, simmer on low for 25 minutes until dark amber colour. Sometimes this will take longer than 25 minutes. Let cool for 10 minutes, then store in containers. I store my wax in empty yogurt tubs. I used to use jars, but one time when I was reheating it to use, it cracked and cut me. 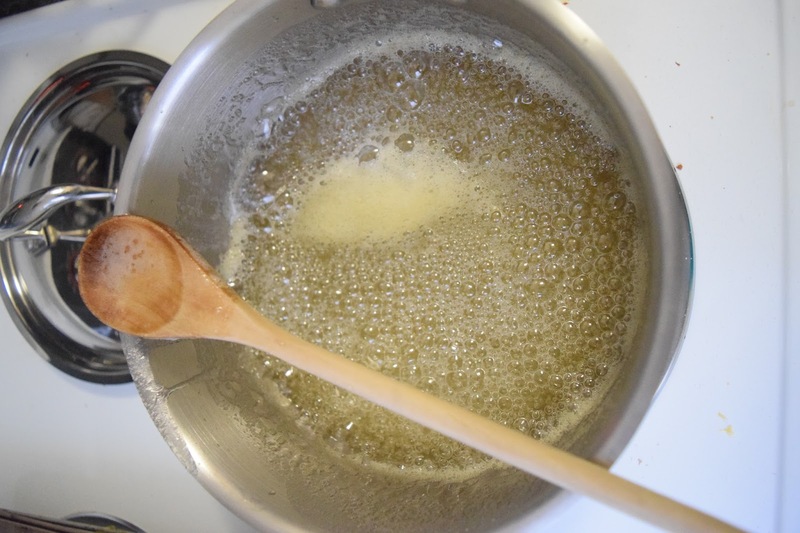 The balance can be tricky, so if you try to wax and it’s not tacky enough, or it’s too liquidy, you can always melt your jar or tub in the microwave, and re-caramelize the wax in the saucepan. It gets frustrating having to do that, but after a while you’ll figure out which exact shade of amber is perfect for you. When prepping to use, microwave your container for 15 seconds, then stir, and keep going until it’s tacky but not too liquidy. Make sure to test the temperature on a small section of your body so you know it’s a good temperature. Be warned! But seriously, test it. 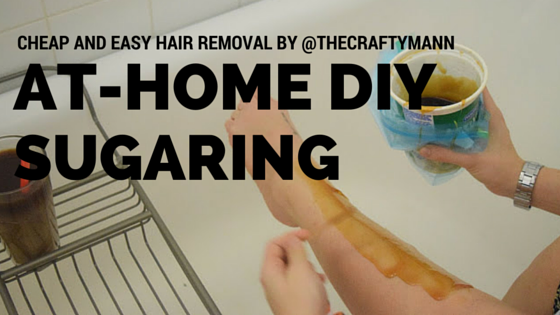 When I first tried sugaring 4 years ago (and then stopped for a long time) I had heated it up too much, and burned through a few layers of skin. Secondary burns are not cool. You can still see the scar on my shin. 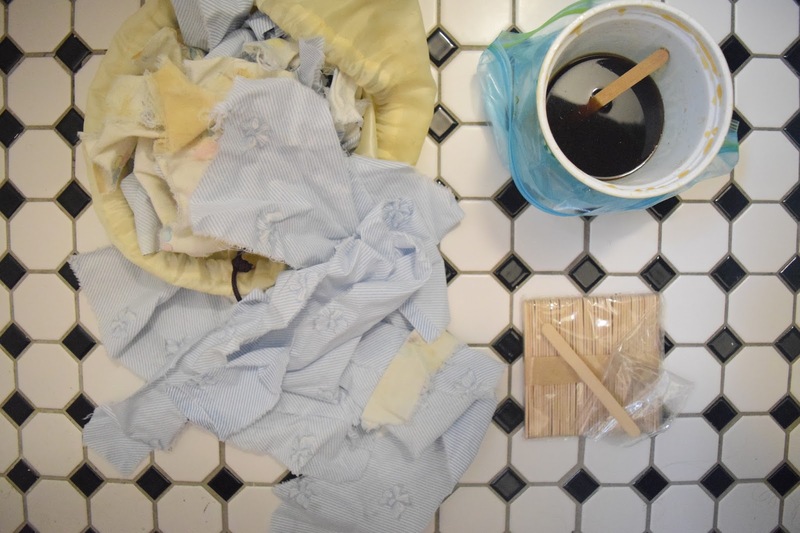 When I’m waxing, I have a whole setup: I have my laptop on a bench so I can catch up on YouTube or Netflix, and another chair with the fabric strips, extra popsicle sticks, and the wax in a tub. Now that I have that lovely bathtub caddy, I can rest the wax in there, so it doesn’t drip onto anything else. Make sure you have everything you want with you, because once you get the wax on your fingers, everything will stick to them. For the pictures, I was sitting on a chair beside the tub, but I usually just crouch in the bathtub. Take your spreading tool and smooth the sugar along the direction the hair grows. It might take a couple tries to figure out the thickness you need to get your hair out. Smooth the fabric strip along the wax patch. Hold your skin at the base (if you’re waxing your shin, hold the skin right at your ankle), and pull the fabric straight back with your other hand. Continue until you’ve gotten as much off as you can. Sometimes you’ll miss a patch, but that’s the same with shaving and regular waxing. Since I usually do the waxing in the bath, cleanup is pretty fast. The sugar melts in the water, so spray down the shower afterward. I also soak the strips in some hot water before rinsing so that most of the sugar melts down the drain. Once most of the sugar is gone, you can pop the fabric strips into the washer and dryer!